But Brian and Ann Mikkelsen Okelberry are as much at home at the Border Inn, or driving along U.S. 50-6, or on a dirt road through juniper and sagebrush, as they are at their home outside Fountain Green. So it wasn’t a big deal for them to drive 153 miles from Fountain Green out to the Border Inn the weekend of Jan. 18-19 for the annual “Old Sheepherder’s Gathering.” They travel between Fountain Green and the Utah-Nevada border three or four times per month, Ann says. 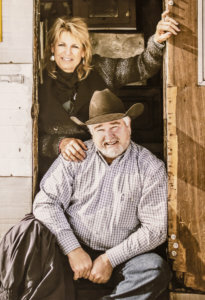 The Okelberrys, who sat down for an interview following the 16th sheepherder’s gathering, are stewards of one of the larger sheep and cattle operations on the so-called “west desert,” which stretches over about 150 miles of western Utah and eastern Nevada. They winter about 9,000 sheep and more than 1,000 cattle on the west desert. They keep the cattle on their 1,000-acre Big Springs Ranch, located 2 miles west of the Utah border and about 28 miles due south of the Border Inn. But that’s just their “deeded land,” as Brian puts it. 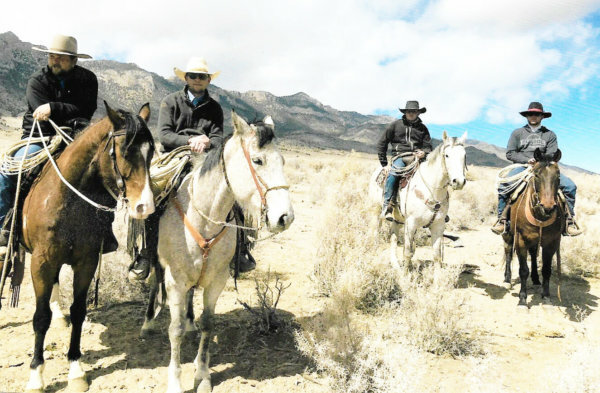 They have grazing rights on more than 115,000 acres of public land in obscure locations such as the Burbank Hills, the Confusion Range, near the town of Garrison, around Wheeler Peak and “deeper into Nevada,” Brian says. But perhaps the most remarkable thing about Brian and Ann is that both represent the fifth generation of sheep ranchers in their families. Both of their great-great-grandfathers, great-grandfathers, grandfathers and fathers raised sheep. And most of those generations wintered their sheep on the west desert. Peter Okelberry, great-great-grandfather of Brian Okelberry, a current-day sheep rancher. Peter Okelberry was first in the Okelberry family to have sheep. Ann is the great-great-granddaughter of Andrew Aagard of Fountain Green, one of the founders of the Sanpete County sheep industry. He built his herds to 25,000 sheep, which he trailed (walked) over road and range from Fountain Green to the west desert. Aagard’s daughter, Hannah, married Jim Mikkelsen. Hannah and Jim Mikkelson were Ann’s great-grandparents. Their son, Elmer and his wife, Mary, who were Ann’s grandparents, were also sheep ranchers. Elmer and Mary had a son, John. John and his wife, Betty, who still live in Fountain Green, are Ann’s parents. They, too, ran sheep. And what is a herd? Typically, Ann says, it’s about 1,000 sheep who travel together across the landscape, grazing as they go. Her father, who is now 82, always had some of his own sheep. But in his younger years, he mainly herded sheep for other ranchers. 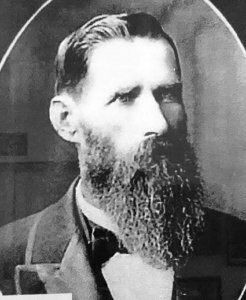 Andrew Jensen Aagard, one of the founders of the Fountain Green sheep industry and Ann Mikkelsen’s great-great-grandfather. At his peak, Aagard had 25,000 sheep. Ann says she was probably about 2 years old when her parents started bringing her out to the desert with them. “I can’t remember not coming out,” she says. She and her parents would sleep in a sheep camp, a trailer with a round top that was cozy warm inside during the winter. From the time Ann was 8 until she was 16, John and Betty Mikkelsen had a “farm flock,” sheep they kept year-round on their land outside Fountain Green. But eventually, her father started taking his sheep out to the desert. In the 1980s and 1990s, he partnered with other sheep ranchers in tending herds, a job that included trucking water to their and fending off coyotes. “Sometimes, he’d come home (to Fountain Green) Christmas Eve and leave the next morning,” she says. “He was still trailing in 1994,” walking sheep from Fountain Green to the west, she says. Brian’s earliest pioneer descendent was Paul Okelberry, who came from Sweden in the mid 1800s. “He was the first guy buried in the Moroni cemetery,” Brian says. It was Paul’s oldest son, Peter, who eventually settled in Goshen, near the border between Utah and Juab counties, and started into the sheep business. Peter was Brian’s great-great-grandfather. Peter’s interests extended beyond sheep. 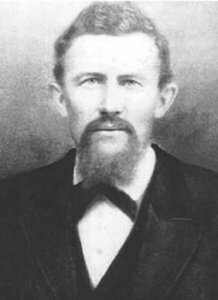 He took a dentistry course in Salt Lake City, and studied medicine on his own, and became a frontier doctor and dentist. He opened a general store and even printed his own currency. Annie Okelberry (left), daughter of Brian and Ann Okelberry; Annie’s cousin, Hope Kearl; and Rafael Hildago, who has herded for the family for 25 years, with prods they use to nudge sheep into corrals on the Okelberry’s summer range in Wasatch County. Once gathered, the sheep are loaded in to trailers and taken to winter range at Big Springs in Nevada, just west of the Utah boarder. Jack’s son, Roy, Brian’s grandfather, acquired substantial grazing rights in Wasatch County. Roy was the also the first in the family to bring sheep to the west desert. He trailed sheep from Goshen to the Burbank Hills, a series of low mountains on the Utah side of the Utah-Nevada border, from 1969 to 1996. One of Roy’s sons, Ray, got a degree in range management at Utah State University. It was Ray and his wife, Sue Ann —Brian’s parents—who really built the Okelberry operation into something of a livestock empire. Like other Okelberrys, Ray and Sue Ann lived in the Goshen area. But early in their marriage, they mainly herded sheep in Wasatch County. In the early 1950s, they herded sheep along Pass Creek in the Unita National Forest east of Heber. Then they purchased grazing allotments in Bryan’s Fork, a tributary to Strawberry Reservoir. Next, Ray and started using one of Roy Okelberry’s grazing leases in the Strawberry Valley about 20 miles east of Heber. Meanwhile, Ray started sharing grazing rights with another family along Mud Creek, a tributary that empties into the west side of Strawberry Reservoir. “Now we were up to four herds,” Brian says. Later, Ray gave up his rights along Pass Creek and instead bought land allocations between Walsburg, a town in Wasatch County, and Strawberry Reservoir. Those are the main areas where Brian and Ann summer their sheep today. In about 1970, grandfather Roy sold his sheep to Ray and another son, Lee. But Ray’s partnership with his brother didn’t last long. In 1972, the brothers split their holdings. Even though Brian was just 10, he remembers that each brother got 1,833 sheep. Ray already owned another 800 sheep, plus 14 cows. Suddenly, Ray was overwhelmed with ranching responsibilities. He had to bring his father, who was 77, out of retirement to help. And at age 11, Brian was herding on his own, staying with sheep for several days and nights at a time. But Ray Okelberry was just beginning to expand. Shortly after Ray split with his brother, Brian remembers driving up Spanish Fork Canyon with his father to buy out another sheep operation. “We got sheep, a sheep camp, a water truck, a commissary (a trailer that holds feed and other supplies), horses and dog,” Brian says. Over the next 16 years, Ray Okelberry made at least six major purchases of sheep, cattle, grazing allotments or deeded land in Wasatch County, on the west desert and in Wyoming. Those included buying out the largest sheep grazing allotment in Utah at the time, buying the Big Springs Ranch and buying a cattle ranch in LaBarge, Wyo. on U.S. 189 between Kemmerer and Pinedale. By the time Brian was 14, Ray had hired sheepherders, so Brian only herded when needed. In 1978, Brian got his driver’s license and started managing the herders. From left are Brian Okelberry’s sons, Jake and Brady, and employees Colton and Keston Grange, at Big Spring Ranch. There is no cell phone or internet service at the property. He said he knew what he wanted to do. He wanted to be a sheep rancher. That decision was confirmed in 1983, when he took time out to be a professional rodeo bull rider. After a year, he drove from Florida to Gosen, 2,600 miles, without stopping overnight. “I wanted to get back to my work,” he says. Brian Okelberry and his first wife lived in the Goshen and Santaquin areas, although they spent a lot of their time on the Big Springs Ranch. They had three sons, Jake, Brad and Jed, and four daughters. The sons “had to herd sheep by age 13 so they could understand me,” Brian say. Don’t tell the highway patrol, he adds, but all of his sons drove semis by age 13 hauling sheep to and from the west desert. Ann and Brian met in the early 2000 after Brian hired Ann to drive semis for him hauling sheep. A little later, they were married. They have a daughter, Annie, 15. Today, their lives have a standard rotation. They winter their stock on the west desert; spend part of April, all of May and the first part of June lambing and shearing their sheep in Juab County a few miles from Goshen; and summer their sheep in Wasatch County. Throw in some time at the cattle ranch in Wyoming. “Sadly my life is more book work now,” Ann says. She and her husband employ 11 sheep herders from Peru who have what are known as H2A visas. Under the visas, the herders work for the Okelberrys for three years, return to Peru for 90 days, and then can come back for another three years. Most of their herders have worked for them for more than 10 years. Ann is responsible for the paperwork involved in maintaining the visas. 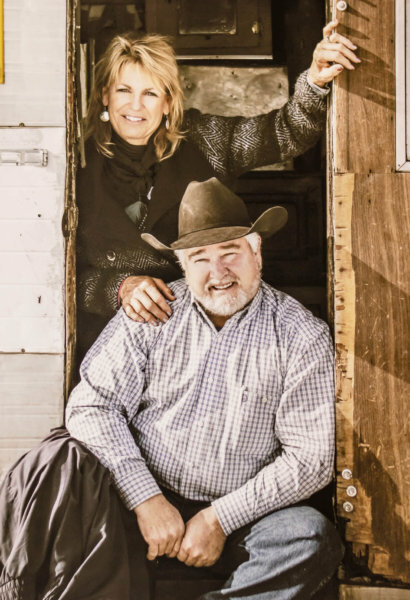 “We both have a great love for it,” Ann says of their ranching lifestyle. Her favorite time is shearing “because everybody’s there.” Depending on the year, the crew can include their Peruvian herders; two resident herders who have both been with the family for more than 20 years; many of the Okelberrys blended family of 10 children; Chris Averett and Trent Jepperson, two young men Brian “adopted” along the way; some of the couple’s 16 grandchildren; and a few nieces and nephews. Typically, it adds up to more than 20 people. “You get to ride in the mountains and see God’s creations,” Brian says. There appears to be a good chance the legacy will continue. Pete Larsen, Ann’s son by her first marriage, is poised to take over John and Betty Mikkelsen’s sheep operation. And Brian three sons, Jake, Jed and Brady, are specializing in various aspects of Brian’s and Ann’s operation, such as shipping, cattle and sheep. Brian’s father, Ray Okelberry, died about six months ago in Goshen. 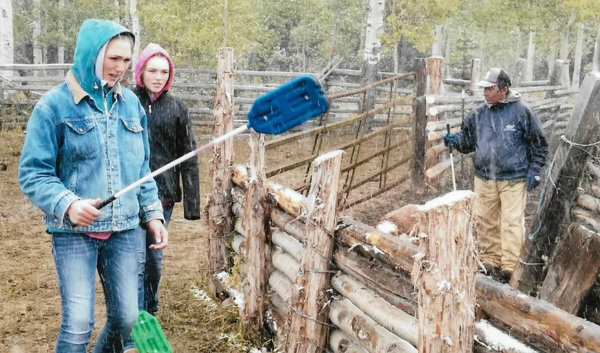 His obituary said of him and Sue Ann, “The love of the ranching traditions is instilled in their children.” It appears the traditions are being passed down to their grandchildren as well.